Joshua Slocum was from Nova Scotia, Canada. He owned several ships as well as commanding many others. After loosing one of his ships, the Aquidneck, on a sandbank in Brazil, he and his family sailed the Liberdade, a canoe of about 35 foot, from the site of the grounding to Washington DC USA, his new home. Perhaps owing to this demonstration of seamanship, a few years later a friend presented him with the honor of restoring the rotting oyster sloop that later became the famous 37 foot Spray. Three years later Spray embarked on her single-handed world circumnavigation. Slocum brought her 46,000 miles and wrote a book about the 3 year epic voyage which finished on June 27 1898. She inspires recreational sailors even today. Slocum is considered a hero of both Canada’s and the United State’s. If only more boat designers would be inspired by the Spray. Today there are over 5000 replicas of the vessel. Slocum was a bluewater cruiser pioneer who was able to put his commercial sailing experience to good use in demonstrating proper design. His 138 foot bark Aquidneck had been used by his family for cruising and carrying cargo when the age of commercial sail was about over. It was common during this time for owners to skuttle their vessels for insurance but the Aquidneck was uninsured when she was lost. Slocum had been studying small boat design and was in the process of building a tender to Aquidneck at the time of the loss. 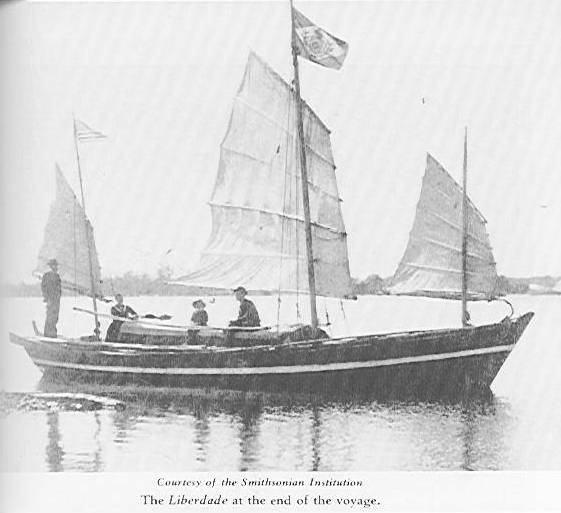 The Liberdade was that tender and she was junk rigged but also incorporated solid flotation in the form of bamboo bundles along her gunwales so that she would be self righting – not unlike RIBed tenders of the modern age. While being towed, Slocum must have realized that the design and construction allowed the vessel to exceed theoretical displacement hull speed safely. 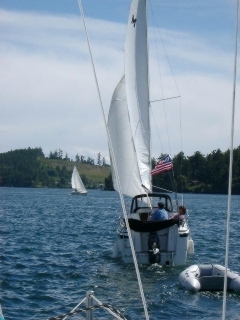 Charles J.Doane reports in Sail Magazine (May 2006 pg 70) that Liberdade was towed at an exciting 13 knots with Slocum’s son ready to chop the tow line free but the vessel did not break up or show signs of being about to. This test likely inspired Slocum to sail at speeds not considered safe for a small displacement hull of her size and Liberdade covered 180 miles in one 24 hour period. While inspiring, I do not consider Liberdade successful in that Slocum’s wife would not join Joshua on Spray for his circumnavigation telling him “Joshua, I have already made my voyage” on Liberdade. The two foot larger Spray is obviously successful given her replicas and this is among the reasons I have concluded that in a displacement hull the vessel must be at least 37 foot for bluewater cruising. 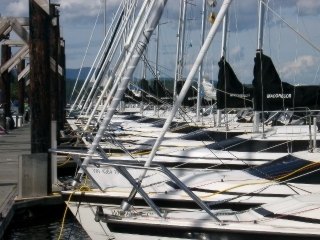 A planing hull such as a Mac26 boat is the alternative.